1981 Vintage Sewing Pattern Simplicity # 5122. Misses vintage size 10. 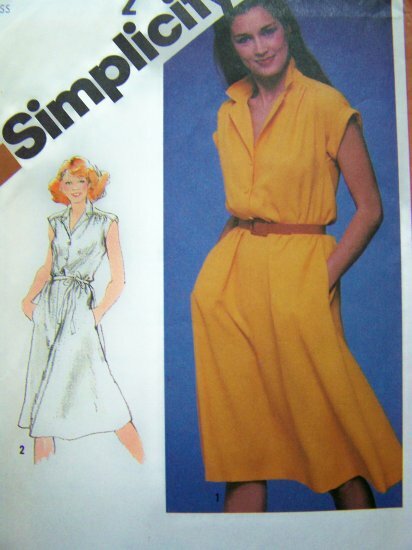 Easy 80's fitting dress with top stitching with bodice gathered to yoke at forward shoulder seams, has notched collar, front button closing, dropped shoulders, elastic waistline, pockets in side seams can be worn with or without tie belt. V 1 has turn back cuffs. V 2 is sleeveless. More new and vintage sewing patterns listed! *Some envelopes are torn, have writing or yellowing from age. Cut patterns may have notes, tape, pinholes, tracing wheel lines or a wrinkled piece. ** UnCut, all pieces included with instructions. Measurements: Bust 32 1/2". Waist 25". Hip 9" below waist 34 1/2". Back neck to waist 16". I have more in this size that are similar. More vintage sewing patterns listed. Suggested fabrics; Crepe and crepe types. Soft cotton types, pique, challis. Extra fabric needed to match plaids, stripes, one way design. Not suitable for diagonal fabrics. International: Paypal only. S & H $5.00. >> I have over 8000 vintage sewing patterns, vintage knitting crocheting and plastic canvas patterns in stock!